The medal pays tribute to a key figure of the Easter Rising. 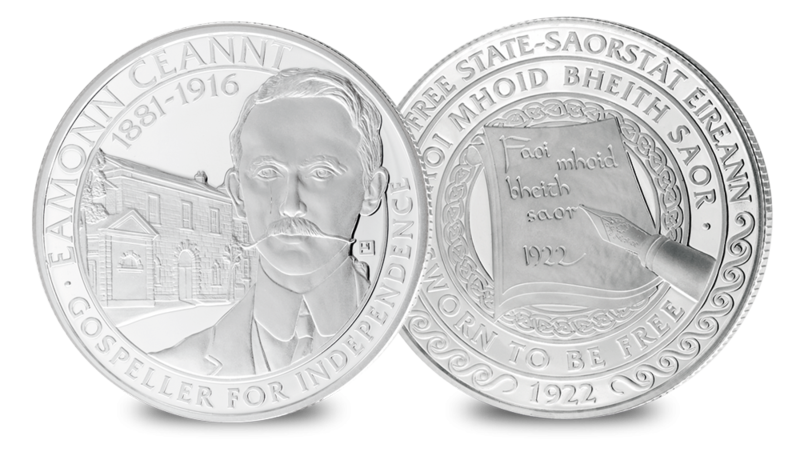 The Eamonn Ceannt medal is part of the seven signatories set which includes seven portraits of Irish Heroes. Each medal depicts the portrait of one of the Seven Signatories, together with their name and a fitting individual inscription. The commemoratives all share a common reverse design inspired by ‘Amhran na bhFiann’ (‘A Soldiers Song’), which was first coined during the Easter Rising and then adopted as the national anthem of the Irish Free State in 1926. Eamonn Ceannt took great interest in Irish culture and history and was, at heart, a “fiery gospeller” for independence. He was a founding member of the Irish Volunteers involved in fund-raising for arms and became commander of their Fourth Battalion during the Easter Rising. On the commemorative medal Ceannt is featured with the South Dublin Union, the Building where he held commandment during the Easter Rising.